OM VISA Consultancy - Global Immigration, Students, Visitor, Business & Work VISA Consultants: STUDY IN WKU UNIVERSITY, AND MAKE YOUR CAREER BRIGHT, WITH THE HELP OF OM INTERNATIONAL THE LEADING VISA CONSULTANCY. 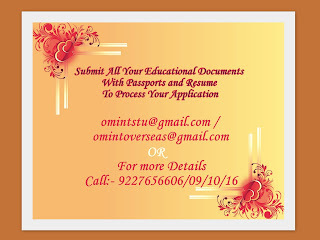 STUDY IN WKU UNIVERSITY, AND MAKE YOUR CAREER BRIGHT, WITH THE HELP OF OM INTERNATIONAL THE LEADING VISA CONSULTANCY. There is still time to be admitted and receive an I-20 and visa before the Fall! Western Kentucky University is still accepting applications for admission for the Fall 2017 intake. With only a two-business day turn-around on an undergraduate admission and I-20, applicants still have plenty of time to get a visa before the orientation on August 14th and classes the evening of August 21st. Western Kentucky University still have scholarships remaining for undergraduate students with competitive GPA's. Scholarship funds remain, but they are disappearing fast. Tuition Fee : $25,080 p.a. • A complete application includes a transcript, proof of English, and financial support documents. • The deadline for applications is August 1st. Late applications will be considered on a case-by-case basis. • There are still scholarships available on a limited basis.